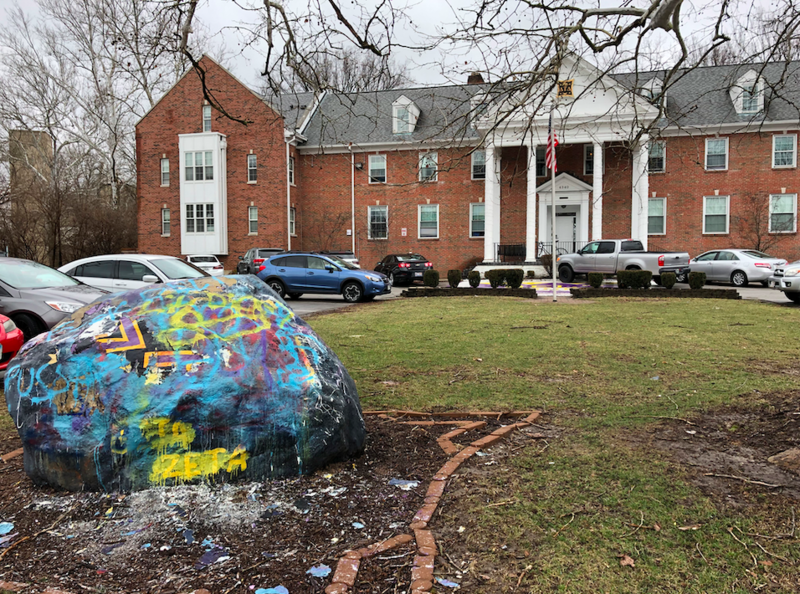 The iconic Delta Tau Delta rock, along with the sidewalk in front of the fraternity house, were defaced last week. Photo by Jessica Lee. Last Wednesday, the Delta Tau Delta fraternity on Butler University’s campus discovered their property had been vandalized. The vandalism included hate speech spray painted on the sidewalk in front of their house. According to the Butler University Police Department crime log, at least four incidents of vandalism have occurred on either Delta Tau Delta or Sigma Nu property this semester alone. But this latest incident contained a homophobic slur. John Conley, chief of public safety, oversees all of the pending vandalism cases. All of these incidents have been reported to BUPD, but no one has come forward with any information about possible leads. Nick Owens, a sophomore accounting major and president of Delta Tau Delta, noted that the property has been vandalized numerous times. Earlier this month, Bentz witnessed another act of vandalism to his fraternity property and reported it to BUPD. This spray paint incident contained an insensitive message about sexual assault. Kyle Giebel, a junior entrepreneurship and innovation major was last year’s Sigma Nu president. Giebel said he has experienced teepeeing, rock painting, sidewalk painting, even one of the letters on the face of their house had been ripped in half. “To me, it seems like someone was trying to be funny or saw the trend of vandalism happening, and they just took their shot,” he said about the most recent incident at Delta Tau Delta. The recent events have prompted Sally Click, dean of student affairs, to express greater concern for the Butler community involving the attacks on student groups. According to the student handbook, the university can hold students responsible for their off campus behavior, as fraternity property is private property. Click said investigators still need to determine if the incidents are a result of individuals acting on their own or if they are being organized by members of the fraternity. Students are held accountable through the student conduct code. Various consequences listed in the student handbook and can vary from a warning to being permanently separated from the institution. Luke Rihm, a junior biology major on the pre-med track, is the president of the Interfraternity Council and is working with Student Affairs to find a solution to the recent vandalism. Within his role, Rihm meets with chapter presidents once a week to discuss issues that may be happening in the Greek community and find solutions to these problems in the future. Chief Conley said he is concerned for the students who may be behind the acts of vandalism. Three out of the six fraternity houses on campus are already on conduct probation. During this warning period, privileges and events are restricted. Depending on the situation, leadership development is also required. If a fraternity on probation were found responsible for vandalizing other houses, the response would be escalated, Click said. “The problem is it starts the ‘who did it’ game and then leads to a series of events like ‘let’s get them back’ and trying to manage that and not let people retaliate,” Delta Tau Delta president Owens said. James Lerner, a first-year risk management major, is a member of Sigma Chi and said he takes into consideration how Greek life is perceived after these events of vandalism. Owens said he “wholeheartedly” believes that these series of acts have put a damper on how Greek life at Butler is perceived. If anyone has more information regarding any of the past fraternity vandalisms, please contact detective Jeff Wager at 317-940-6584.